Close to 100,000 tweets had used the #ArmMeWith hashtag by Saturday morning. Educators around the U.S. are protesting proposals to arm teachers by posting with a hashtag, #ArmMeWith, to ask for more school counselors, books, snacks for hungry students and other things they say schools need rather than guns. The hashtag has as of Saturday morning been used about 96,700 times. The #ArmMeWith posts come after President Donald Trump called this week for arming teachers in the wake of the latest school shooting, the Feb. 14 massacre at a high school in Parkland, Florida, that killed 17 students and staff. The president said teachers with guns would offer better protection than a security guard who "doesn't love the children." He has also said teachers would be able to respond more quickly than police. The nation's teachers' unions swiftly rejected the idea. , said there was a telephone town hall with 60,000 teachers Wednesday night and "the response was universal, even from educators who are gun owners: teachers don't want to be armed, we want to teach." 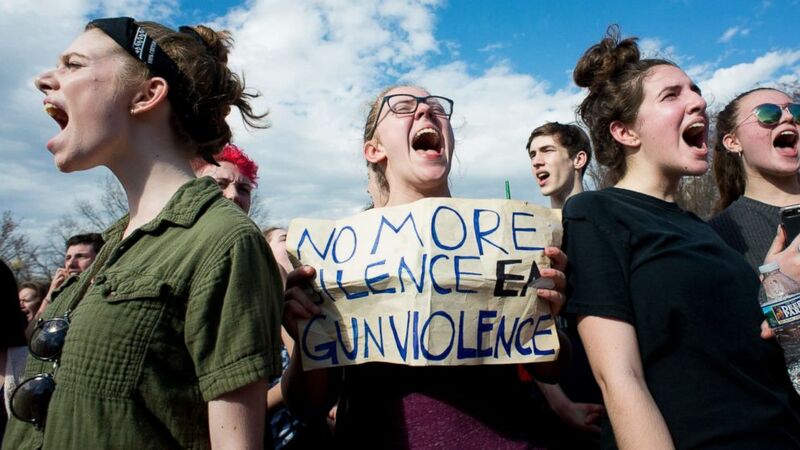 "We don’t want to be, and would never have the expertise needed to be, sharpshooters; no amount of training can prepare an armed teacher to go up against an AR-15," Randi Weingarten, the president of the American Federation of Teachers, said in a statement. "How would arming teachers even work? Would kindergarten teachers be carrying guns in holsters? Is every classroom now going to have a gun closet? Will it be locked? When you have seconds to act when you hear the code for an active shooter, is a teacher supposed to use those seconds getting her gun instead of getting her students to safety?" Many teachers on social media appeared to agree, using the #ArmMeWith hashtag to oppose the notion of arming educators while highlighting basic resources that they suggest their schools lack. A Twitter user whose profile says she is a Pittsburgh teacher posted a sign promising "to fight for my students and colleagues. 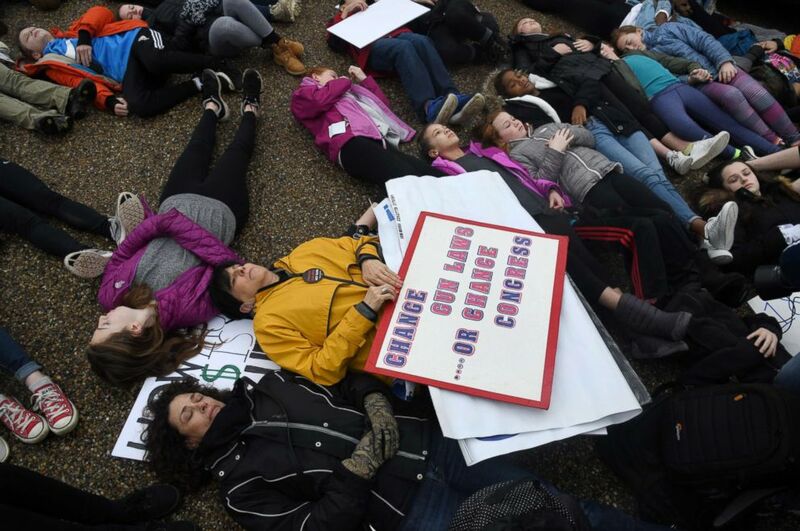 Please "#armmewith the things I need"
(Douliery Olivier/ABACA via Newscom) Students take part in a "lie-in" on the road outside of the White House, Feb. 19, 2018 in Washington, D.C.
Another educator says "I would risk my life to save my students but I would never keep a concealed gun in my classroom." Instead, this teacher asks for tissue and paper towels. I AM A TEACHER. NOT A POLICE OFFICER, NOT A SOLIDER, NOT A BODY GUARD. I would risk my life to save my students but I would never keep a concealed gun in my classroom, nor use it EVER. #ArmMeWith TISSUE & PAPER TOWELS. that’s all, Please & Thank you. Some supporters of arming teachers used the #ArmMeWith hashtag to counter critics of the idea. One user named Chuck posted that nothing teachers are saying they want "protects students. What will they do when a shooter is outside their schoolroom door?" A woman with the handle @LauraD329 said #ArmMeWith tissues, books, "the same resources the military gets ... DO NOT ARM ME WITH A GUN." (Erin Scott/Polaris) Students from the D.C. area walk out of class to demand gun control legislation at a gathering outside the White House in Washington, D.C., Feb. 21, 2018. Another woman who identifies herself as a teacher says "#ArmMeWith my own voice. Educators should make decisions about education, not politicians." #ArmMeWith my own voice. ? ?Educators should make decisions about Education, not politicians who have their own agendas. One Twitter user identified as a school counselor in San Francisco says she needs lower ratios of counselors to students and better connections to therapists for "my anxious, suicidal & lost kids." - nationally recommended student:counselor ratio of250:1(presently at 400:1). - connections to therapists for my anxious, suicidal & lost kids. One educator acknowledges a need for school security but says it should not come for her carrying a gun "around a preschooler." #armmewith trained security personal to intervene in the case of an emergency. Don’t ask me to carry a gun around a preschooler. 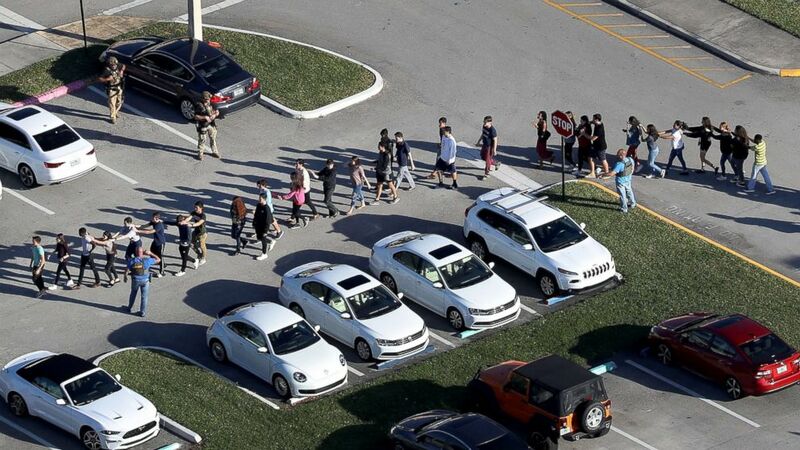 (Joe Raedle/Getty Images) People are brought out of the Marjory Stoneman Douglas High School after a shooting at the school that reportedly killed and injured multiple people on Feb. 14, 2018 in Parkland, Fla. The movement is drawing the attention of some celebrities, such as singer Ricky Davila.